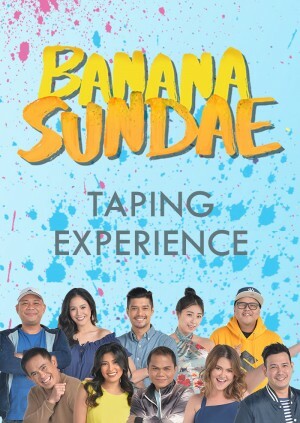 See where your favorite shows take place and learn more about ABS-CBN before you meet the Banana Sundae barkada! Call time at the Studio Tours Office in ELJ Building is 4:30PM. Failure to arrive before 5:30PM at the ABS-CBN Studio Tours Office in ELJ Building will forfeit your ticket. Tour rescheduling is not yet allowed. Children below 7 years old, pregnant women, and persons with heart conditions shall NOT be allowed to be part of the audience. Adults must accompany children at a 1:1 ratio, and may be required to present proof of age of a child (such as birth certificate or school ID). Call Time at the Audience Entrance is 6:00PM and cut-off time is at 6:30PM. Present your ticket upon entry. Failure to arrive before 6:30PM at the ABS-CBN Audience Entrance will forfeit your chance of watching the show. Strictly no refund for no show. 7. For Show Only tickets, failure to arrive will mean cancellation of ticket. Strictly no refund if you are unable to attend. 8. For tickets with Studio Tour, failure to arrive will mean cancellation of ticket. Tour rescheduling is not yet allowed. 9. ABS-CBN reserves the right to refuse admission of guests who fail to comply with the safety regulations of ABS-CBN.